Breakfast or Lunch? Brunch Dishes! My grandmother, a third-generation Texan, and my mother made the best deviled eggs I’ve ever had. When I moved away from home, I discovered not everyone made their deviled eggs the same way. Then I found that PK’s mother was from East Texas and made her eggs almost the same way, but didn’t include bacon. For this reason, I’ve dubbed these Texas Deviled Eggs since the sweet deviled egg seems to come from that part of the country. When I take them to parties, people usually want the recipe. Eggs are great on a low carb lifestyle because they are so low in carbs and it takes your body a long time to digest them, which keeps you satisfied for a while. 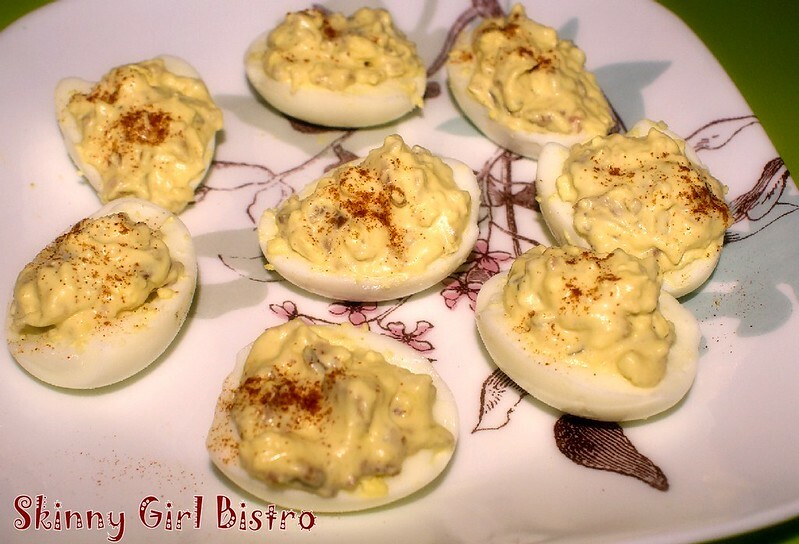 These deviled eggs are wonderful to take on picnics or to 4th of July parties or other summer occasions. Just be sure to keep them in the cooler (with ice) until you’re ready to eat. I’ve adapted these ever so slightly for low carb, mainly using sugar-free sweet pickle relish or sugar-free sweet pickles in them. If you can’t find the relish, look for the sugar-free sweet pickles and chop them finely in a chopper or food processor. Cut 6 eggs in half and scoop the yolk into a bowl. Set the whites on a plate to be filled later. Cut up the last egg and add to the bowl. This will be the filling and the extra egg ensures a mound of filling on each half. Mash the filling with a fork until it is completely crushed and mixed together. Add the mayonnaise, mustard and pickle relish. Be sure to get the juice in it. Mix together, then stir in the bacon bits. If the mixture is too dry, add a little more mayonnaise. Add salt and pepper and mix it in. Put a mound of filling in the center of each egg white half so that it completely fills it and spreads over the top. It may help to use your spoon to make four even sections of the filling, then use 1/3 of each section to fill the egg whites. Sprinkle paprika over the top for a light dusting of red, then place on serving plate, cover with plastic wrap and put in the refrigerator until ready to serve. Tip: Getting decent-looking eggs after boiling is sometimes a challenge. There is some truth to not using really fresh eggs for this. I try to plan ahead to allow at least a week for the eggs to sit in the refrigerator. This makes it easier for the membrane to separate from the egg. I put cold eggs in a pan of cold water to cover, then put on the heat and bring to a boil over medium-high heat. Turn down and cook another 5 minutes, then turn the water off. Let the eggs sit another 5 to 10 minutes, then run cold water over the eggs. You can add ice to help chill them quicker. Break the egg shells in several places and carefully peel part of the shell away and lift the membrane away from the egg if it doesn’t come free with the shell. Put the egg back in the cold water, then peel the rest of the egg while trying to pull the membrane away from the egg gently. If this is too much work for you, purchase pre-peeled eggs at the grocery store. They cost almost double but are worth it if you’re in a hurry. I’m not a fan of any eggs unless they’re scrambled, but it sure looks like a tasty recipe! If you would like to receive email notices when I release a new cookbook please sign up on this mailing list and select Skinny Girl Bistro. You will receive notifications of blog posts when you sign up for this blog, not from the above list. Content copyright Skinny Girl Bistro. All rights reserved.